The story of the hero, is narrated through Prema, a retired policeman's daughter who is infatuated with Yudas, a man whose existence is all about diving into lakes and river bodies to retrieve corpses. The novel is constructed around Prema's dangerous obsession with Yudas, who is still grieving over his betrayal of the woman he loved - Sunanda. This leads Prema to undertake an intense exploration of his past, blending with it all the elements of a bittersweet love tragedy, neither page turning nor sensual, but deeply moving. One of the most impressive aspects of this book is that within the hidden layers of human behavior, more is revealed about what the Emergency did to change human nature, turning it into something darker than we can ever imagine and how those people caught in its warp try to snap out of it but remain stuck, unable to pierce beyond the damage that the era has wrought on them. We are perplexed by the questions that Yudas and Prema inject into our minds as they dive deep within their own seas asking- What is it about fear that causes people to betray those whom they love? Prema's self-inflicted confusion is consistent and comes through more strongly than the author may have intended. It is made bare for us to see when she meets Sangeeta, who tells her, "I am not scared, sister. Don't I have the blood of Sunanda and my grandfather coursing through me?" The emotion this statement triggers in Prema makes her vulnerable and strong at the same time, as she reels under its impact, "I was speechless. Rage surged inside me...Sunanda was always ahead of me." This 'Prema-moment' feels like the ultimate moment of truth and betrayal. 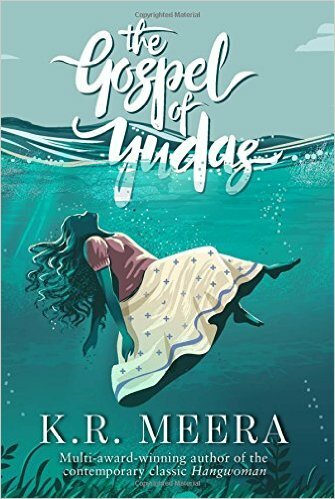 KR Meera's novel, The Gospel of Yudas, offers no answers but it is dark and brilliant in a way that intensely grips your mind, word by word, para by para and page by page. Prema's obsession throws into your face the bleak truth of what happens to human beings when they are forced to conform with laws imposed on them by an authoritarian State, where brutality becomes a way of preserving the draconian laws. The way this book ends turned out to be slightly disappointing for me. I had expected something very unpredictable, as KR Meera had done in The Hangwoman. But that didn't happen with this latest novel on Yudas. Summing up, KR Meera's "Gospel of Judas" is a short, gripping book that has much to say about how the Emergency messed up many lives in Kerala. Now, it's your turn to tell me - What's on top of your reading list this winter? Many congratulations for your wonderful blog. You are doing a great work in raising awareness. I realized the emptiness couple of years back and since then have been doing my sadhana and learning under the guidance of guru. Sometimes I write on spirituality, please check powerinself.blogspot.in . For last 6-7 months I am feeling intense urge to do something in this direction, everything else has become secondary. So I have decided to start ‘Spiritual Travel’ for real seekers of truth. Commonly spiritual travel is understood as pilgrimage or visiting religious organization or ashram. They become more like sightseeing trips or faith travel with no advancement in knowledge. Our idea is to design a trip where the seeker gets knowledge of truth, interaction with learned, yoga and meditation. I have myself visited many enlightened saints and I want to share same experience to other genuine seekers. The destinations could be Vrindavan, Rishikesh, Dharamasala etc as of now. It’s for both Indians and foreigners; a 10-20 days of group travel wherein interaction, education, yoga, meditation will be included, something like this worldweavers.com . I want your views on the practicality and potentiality of this idea and discuss the possibility of your association in package designing, general guidance and interactions. This will be on commercial basis. We are not focussing on any specific religion or school of thought but only on ‘pure knowledge’. As of now this is what I have thought and am working on details. Looking forward to your reply and appreciate your guidance. I have been wanting to read this book since long. I am a malayali and am proud of Meera's writings. Wow, I haven't read much fiction of late Swapna but this book seems intense! !